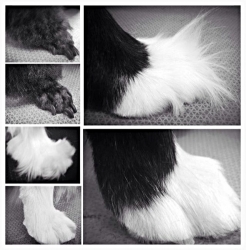 Handsome Hounds provides hands on care ensuring your dogs grooming experience with us is an enjoyable one. We pride ourselves on an exceptionally high standard of groom always with a style agreed upon with the pets owner on arrival. At Handsome Hounds we understand that not all owners want their dogs to look like the breed standard and we will endeavor to work with you to find style that you want and are happy with.. Handsome Hounds recommends that dogs are groomed every 6-8 weeks depending on breed and coat to ensure a healthy and shining coat all year round. Puppy's are welcome as soon as they have had all their vaccines, we encourage puppy's to come from an early age so they can get accustomed to the procedures of being groomed and enjoy all the fuss and attention. We also enjoy the cuddles too! Handsome Hounds now offers a pet loyalty scheme for all our regularly groomed dogs, please ask for details.. Handsome Hounds offers a dog bathing package. This is great for dogs who don’t need clipping and styling but still shed fur. 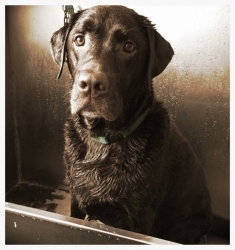 Bathing every 6-8 weeks maintains a healthy shiny looking coat, keeping your dog clean and comfortable. Routine brushing/grooming will help distribute the natural oils throughout the coat, avoiding matting or hair clumping problems, at the same time as removing dirt, burs and other outdoor debris. Regular grooming will also cut down on your dogs hair shredding at home. We will also automatically check for dog for unwelcome visitors such as fleas and ticks! Longer haired dogs or high maintainable coats can also benefit from a bath in between their full grooming appointments to keep their coats clean and flowing freely. Prices may vary depending on condition and size of dog, please call us to discuss your dogs needs.. Handsome Hounds now offers a pet loyalty scheme for all our regularly groomed dogs, please ask for details. As a general rule, you should have your dogs nails trimmed and checked once a month. If your dog walks a lot, or is outside on concrete.. They will naturally wear them down, so they won't need to be trimmed as often. If your dog is older and doesn't walk as much they will need to be trimmed more often. But, normally once a month is good. Pictured is an example of a dogs nails that have grown to long, it's paws can get sore from the constant pressure of walking on overgrown nails, this dog also runs a high risk of getting its nails caught on something and possibly ripping them, Broken nails are very painful..
A dogs nails should not touch the ground, so if you hear clicking on hard floors, it's time to trim. Most dogs don't like getting their nails trimmed, so proper introduction from an early age is extremely important..
MATTED DOGS – WHAT EVERY OWNER NEEDS TO KNOW…. Matting is densely tangled clumps of fur in a dogs coat. Sometimes matts can be combed out, but – if left too long is impossible. 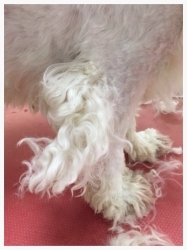 Severe matting can be extremely painful to the dog during brushing. Dense matting can deny regular air circulation. Skin denied fresh air and stimulation from regular brushing can become unhealthy. 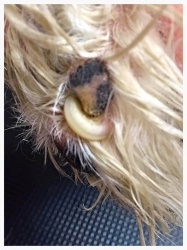 Skin can turn dark pink/red and open sores can form emitting foul odors, sometimes matts and their consequences can be completely hidden from view. Some severely matted dogs may require the attention of a vet..
Shaving off a matted coat is a delicate and slow process requiring patience, experience and expertise. PREVENTION is easy, dead loose hairs should be removed through regular brushing. 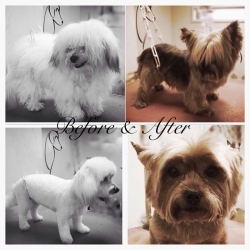 Grooming should be done every 4-6 weeks, after 8-10 weeks a coat may become to dirty and matted to maintain ( depending upon breed and dogs lifestyle).